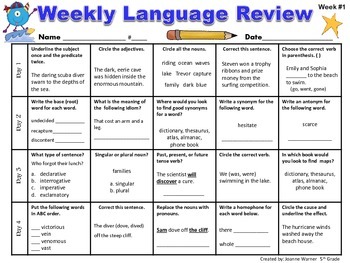 5th Grade Weekly Language Review is an entire year of spiral review (36 weeks). 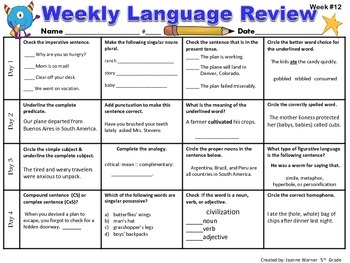 Your students will continually review common core standards of: grammar, spelling, figurative language, and vocabulary skills. I created this product out of frustration with my students' lack of retention of previously taught grammar skills. 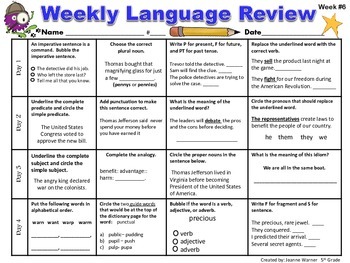 Every year we teach the basic parts of speech, types of sentences, subjects, predicates, etc., and every year my students seem to only vaguely remember learning/hearing the words. I believe this is due in part to the way our textbooks introduce a skill for a week or 2 at best and then move on too quickly. With this product, my students have gained confidence and mastery of difficult grammar concepts with ease. I use these pages as part of my students' morning work. Then, I project the page, and we have a brief tutorial. Usually this takes about 10 minutes of my 60 minute language block. I'm thrilled with the results...hopefully you will be too. 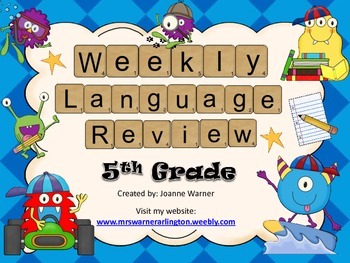 The vocabulary words and skills used in this product follow the McGraw-Hill Reading Wonders Program.